Knowing about my goal to learn one new thing every month this year, Cath suggested we try out a sewing class at Spool of Thread in Vancouver1. I’d never sewn anything using a sewing machine before, and Cath hadn’t sewn since high school where she used a machine from the Stone Age, so we took the introductory how-to-make-a-tote-bag class. Our other friend, Stephanie, who has a little more experience than Cath and I, also joined in the fun. I have to say, Spool of Thread is a cool little business. 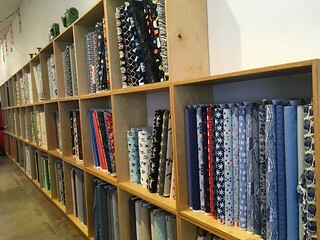 They sell sewing supplies, hold sewing classes to make things of varying levels of difficulty, and you can even rent time on their sewing machines (along with use of the associated space and equipment – a big table to cut out your fabric, irons and ironing boards, and all the pins in the world). The renting of the sewing machine time is a particularly good idea in a city where everyone lives in tiny condos (because who has room for a sewing machine?) – and also for people who have curious cats that love to sit on whatever you are working on at the moment (because who wants to end up sewing a cat into their tote bag?). You could bring your own fabric to the class, but we all elected to buy some fabric there. There was an extensive range of options and I spent an embarrassingly long time trying to choose. The tote bag is reversible, which meant we had to pick two fabrics, and every time I picked one that I liked, I couldn’t decide on another one that would go with it. I. The end I decided to go with a black and white theme and picked ampersands on one fabric and stars on the other. The sewing teacher, whose name I completely forget, explained all the parts of the sewing machine, took us through how to thread the sewing machine, and then step-by-step through how to make our tote bags. As it turns out, the easiest part of sewing is the sewing part. Threading the machine, cutting your fabric, and pinning it together correctly take about 99.9% of the time and effort, but the actual sewing is relatively easy, at least as far as sewing a tote bag where you only need to sew in straight lines. And while not all my lines came out perfectly straight, they came out straight enough and Cath and I agreed that we are both better sewers than we are painters. 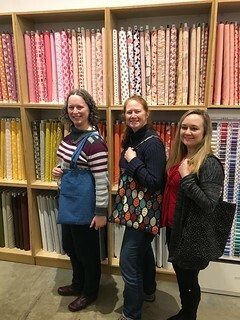 Cath, Stephanie, and me with our new tote bags! 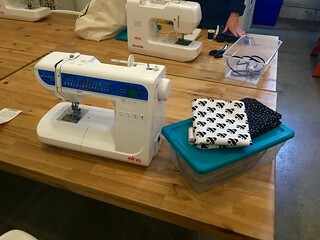 During the class, when we were cutting our fabric, the teacher mentioned that we’d have enough leftover fabric to take the how-to-make-zippered-pouches class – we’d learn how to sew a zipper and have pouches to match our totes! He also mentioned that since we get the pattern and instructions for the tote bag, we probably should come back to rent a machine to make another one to reinforce our learning. And when Cath inquired into it later, apparently the zipped pouch course is more advanced, so we’d need to take at least one more introductory level class before we do zippered pouches. 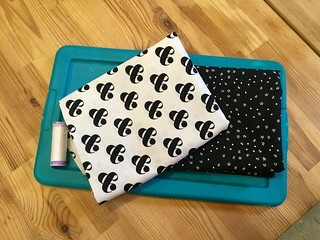 So they’ve really got a good little system set up from a business perspective because all of that does make sense – I do want to have pouches that match my tote and I want to learn how to sew more things and I kinda want another tote bag – and it all just so happens to increase their sales! All in all, I really enjoyed my sewing class! I got to make something useful (I often use my tote bag to bring stuff to work), I learned something new, and now I want to do more sewing!